Candy wrapper handbags are really an incredibly fun and fashionable way to show off your own unique style. Do you remember making paper chains with your gum and candy wrappers when you were a kid? I sure do! I thought I was being pretty clever, but some people have gone above and beyond to create some really practical and usable gifts that are actually quite stylish. One of the most popular companies in the market today when it comes to making candy wrapper bags is Nahui Ollin. 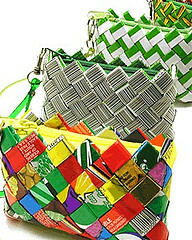 Nahui Ollin has a wide selection of candy wrapper bags that include mini purses, camera bags, and full sized handbags. What's really amazing about these handbags is that they are made by hand and use thousands of candy wrappers in each creation. It usually takes about 4 days to make one of these beautiful bags. The candy wrappers that are used are slightly damaged candy wrappers that the candy manufacturer can't use on their products. Instead of throwing the damaged candy wrappers into our ever growing landfills, they are being put to great use. That's "re-purposing" in fine style! If you have trouble finding the perfect gift for a lady in your life, one of these gorgeous candy wrapper purses or handbags would be just the thing! They are bright and cheerful, top quality, and are even environmentally friendly. You can't go wrong! Let's face it. Girls love shoes and purses! I know my husband is always complaining that I have far too many myself. But really, can a girl have too many purses or too many pairs of shoes? We all know the answer to that one! What I particularly love about this chocolate gift candy idea, apart from the obvious, is that indulging in a candy wrapper purse doesn't add any calories to my diet or pounds to my waistline. The older I get, the more important that becomes!